Fig. 1 The endogenous fatty acid pool: Fatty acids (FA) are obtained either from endogenous synthesis or the diet. 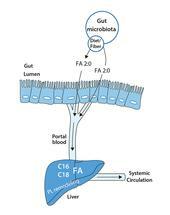 Gut microbiota are crucial for short chain fatty acid generation. FA can be further metabolized to complex lipids including phospholipids (PL) and triacylglyerols (TAG). Lipids are either obtained from exogenous sources, i.e. diet, or from endogenous biosynthesis (Fig. 1). Numerous cellular processes such as cell growth or differentiation rely on de novo synthesis of fatty acids primarily for cell membrane generation . The enzyme fatty acid synthase catalyzes the generation of palmitate (C 16:0) from acetate. Palmitate is a major saturated fatty acid in mammalian cells, tissue and plasma. It can be further metabolized by elongases and desaturases to longer chain and mono-unsaturated fatty acids. A crucial organ in overall lipid homeostasis is the liver, playing critical roles in many metabolic diseases, particularly in type 2 diabetes. The key technology for lipid analysis is mass spectrometry. Because lipidomic approaches are nowadays able to cover almost the full lipidome, there is a real hype in the field as it opens new ways to study lipid biology in numerous research areas. However, this comes along with an increasing number of studies that report poor quality lipidomics data. 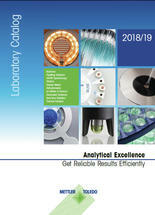 The reasons for this are manifold covering analytical, bioinformatic and educational aspects. For instance, adequate controls of sample handling and processing to assure analyte stability are often missing, so are the use of appropriate internal standards, which are essential for proper quantification and identification of lipid species, and correct lipid annotation . The application of stable isotope-labelled tracers combined with reliable mass spectrometric analysis is the state-of-the-art approach to gain insight into synthesis, metabolism and fluxes of lipid species . The mammalian gut harbors highly complex microbial communities, referred to as the gut microbiota or microbiome when considering their genomes and surrounding environmental conditions. Previous studies have shown that the gut microbiota contributes to food processing; makes non-digestible nutrients available to the host; and provides important functions in host immunity, physiology and metabolism. As lipidomics, microbiome research is currently a hot topic in the scientific community and has even reached daily newspaper and broadcast media . This contributed to the establishment of misleading concepts in the field that are mostly based on association studies . The hype surrounding lipidomics and/or microbiome research led to a vast number of publications with diverse scientific quality. However, particularly in the last years, several studies have substantiated the importance of gut microbiota and lipids for principal biological processes, physiology and pathophysiology. Fig. 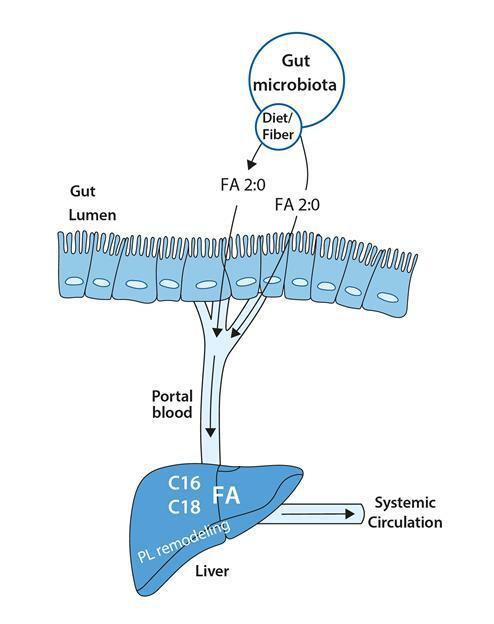 2 The gut microbiota promotes hepatic fatty acid synthesis: Dietary fiber/polysaccharides is/are degraded and fermented to acetate in the gut lumen by gut microbiota. Acetate is used for synthesis of longer chain fatty acids and phospholipids after it reaches the liver via the portal vein . We have just recently discovered an interaction between diet, gut microbiota and host lipid metabolism . After employing multi-omics analyses, it was found that mice with gut microbiota have significantly elevated levels of mono-unsaturated fatty acids and expression of transcripts and proteins relevant for de novo lipid synthesis compared to mice without gut microbiota. Mono-unsaturated fatty acids are the final product of endogenous fatty acid generation. Using dietary intervention strategies and mechanistic investigations including stable isotope labelling in combination with mass spectrometry we demonstrated that hepatic lipid synthesis significantly depends on gut microbiota. The short chain fatty acid acetate originating from gut microbial degradation of dietary polysaccharides, i.e. fiber, by members of the phylum Bacteroidetes, is used as precursor for synthesis of longer chain fatty acids and phospholipids in the liver (Fig. 2). Fig. 3 Stable isotope labeling of hepatic de novo fatty acid synthesis: Mice were supplemented with 13C-acetate via oral gavage (n=3/group) before palmitate of liver samples was analyzed for 13C-enrichment by gas chromatography coupled to mass spectrometry (GC-MS). Palmitate can be synthesized from labeled and/or unlabeled (natural) acetate monomers. The unlabeled monomers (grey) contain no 13C-isotopes, the labeled monomers (dark green) contain 13C. 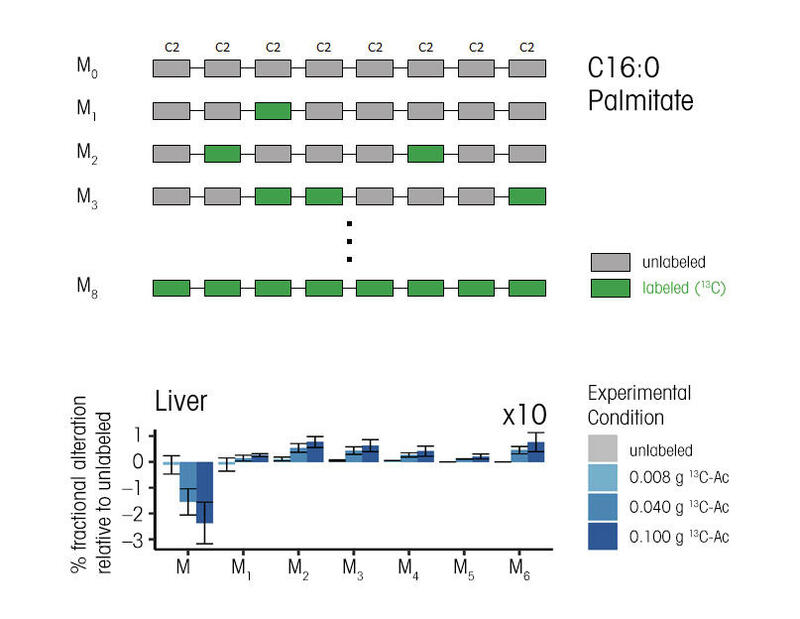 After four hours of labeling we found a significant enrichment of 13C in hepatic palmitate. The increased fractional abundances of M2-M6 isotopologues (comprising 13C) show that gut luminal acetate is a precursor for hepatic lipid synthesis. To proof that acetate originating from the gut lumen is used for hepatic fatty acid de novo synthesis, mice were supplied with stable isotope-labeled (13C) acetate via oral gavage. 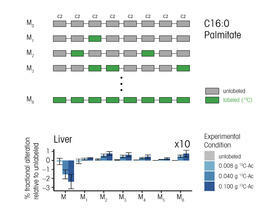 The enrichment of 13C in palmitate from liver and plasma samples was confirmed after a mass spectrometric analysis (Fig. 3). To verify that hepatic lipid synthesis further depends on gut microbial acetate producers and dietary fiber, Bacteroidetes contents were modulated with antibiotics and mice were fed with diets containing a non-degradable and fermentable fiber source or different fiber contents. Together, our work identified a novel lipid metabolic flux and synthesis pathway along the diet-gut microbiota-host axis. To put the research fields on a reliable basis, experts have to join forces on a cross-border basis to define standards for robust microbiome research and lipid analyses. Further, scientists have to look beyond their horizon and critically evaluate the obtained data before publication to drive scientific progress in the fields. Our finding of gut microbiota influencing hepatic lipid synthesis might open the door to prevent and treat metabolic pathologies by specific modification of the diet and/or gut microbiota. Josef Ecker`s research is supported by the “German Research Foundation” (DFG) [EC453/1-1; Priority Program (SPP) 1656, EC453/2-1; Collaborative Research Center – Project number 395357507 – CRC 1371] and “ZIEL – Institute for Food & Health”/Technical University of Munich (TUM).